We are pleased to announce an update to Outlook.com that lets you make the most of the moments that matter to you—featuring a refined inbox, new ways to collaborate, an upgraded calendar and much more. This update is rolling out today, in Preview, to a small group of customers and is the first of many innovations coming as we upgrade Outlook.com to a new Office 365-based infrastructure. These new features will be made available to a broader audience through an opt-in program in the coming weeks. The Bing Maps add-in lets you effortlessly open a map and get directions to a location found in the body of a message. Whether you’re planning a camping trip with friends, working on a project with classmates or just trying to get everyone to agree on dinner plans—email is one of the most important ways you get things with others. With that in mind, we’re adding several new features to make staying on the same page a cinch. New Skype experience—Seamlessly shift conversations between email and Skype. Chat with a group, or one-on-one, using all your favorite Skype emoticons. Start a voice or video call by pressing the call button. Simplified sharing from OneDrive—Sharing files through the cloud is the best way to keep everyone on the same page, but uploading a file and setting permissions can add a lot of extra steps. Now it’s easy, just attach the file to your draft message—drag and drop or with the file picker—and with one click you can convert it to a shared OneDrive link. Side-by-side views—Open an attachment and see it side-by-side with the email. You can view or edit Word, PowerPoint and Excel documents while simultaneously replying to the original message. Best of all, any changes you make to the file are automatically saved and attached to your response when you hit send—no need to download, edit, save and re-attach the revised file. Side-by-side view works great with photos too. 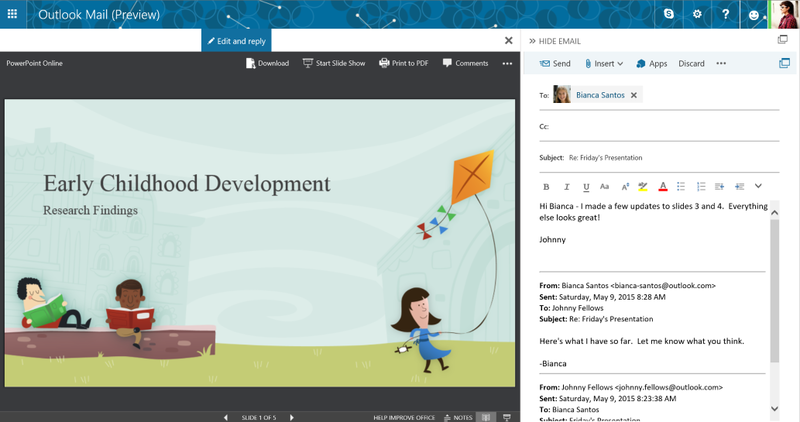 With side-by-side views, your content and conversations coexist. It works great with the free online version of Word, Excel and PowerPoint. 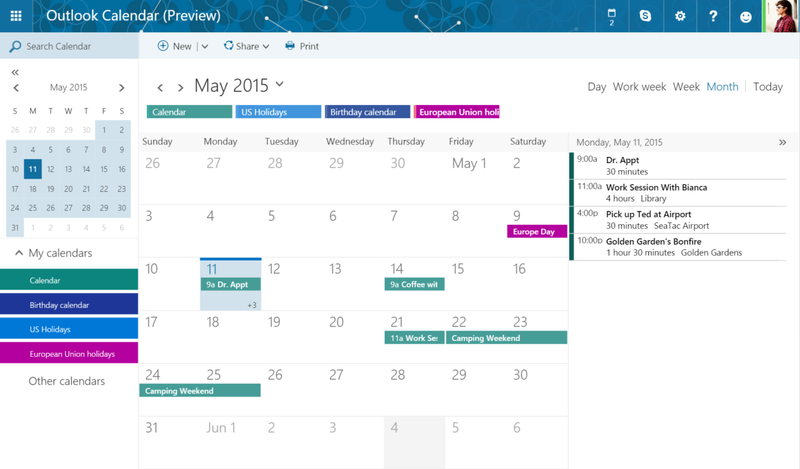 The Outlook.com calendar is one of the best ways to stay in sync with your friends and family. With new features and improved navigation, you can easily manage shared calendars, quickly find events by searching for the name, invitees, location or description and stay on top of the dates that matter to you with over 100 country and religious calendars. New collapsible panels on the left and right side of the calendar make it even easier to manage your time and stay on top of upcoming events. The Outlook apps across Windows, iOS and Android provide a rich app-based for phones, but for those who prefer to access their account on a mobile browser, we’re introducing a cleaner experience with new features like swipe gestures and support for add-ins. You’ll also find great new mobile-friendly views for your calendar and contacts. In addition to the new features we’re announcing today, we’re also excited to share an important change to how we gather and prioritize feedback. We want to foster a more dynamic conversation—giving our community a chance to see and hear what others are saying and at the same time, creating a direct line of communication with the team that builds Outlook.com. Today we’re launching the Outlook UserVoice, an open forum for you to share feedback, recommend features, and vote for the ideas you like best. Joining the conversation in the updated web experience is easy—just click Feedback under the Gear icon and you can make your suggestion without leaving your inbox. If you’d like to see and vote on other ideas, you can always visit Outlook.UserVoice.com and sign-in with your Microsoft account. Simply post your idea or comment to give feedback directly to the Outlook.com team. We hope you’re eager to try out all of these new features. Stay tuned for more news from the Outlook.com team, including exciting new announcements and details on how you can opt-in to the new experience. Q. Will I need to change my email address? A. No. We will never make you change your email address. Q. Will I need to change or update any settings on my phone or other apps to keep receiving email? A. The vast majority of customers will not need to make any changes. If changes are needed, Outlook team will proactively send instructions to ensure you stay connected. Q. Will Outlook.com users have to pay for an Office 365 subscription? A. No. Outlook.com will remain a free, ad-supported service. Q. After receiving the update, I don’t see any ads. Will the updated user interface be ad-free? A. No, Outlook.com will remain an ad-supported service. Q. When will I be able to opt-in and get these new features? A. Opt-in details will be shared in the coming weeks.